As some of you may have already know, the mrbrown show has had its own URL and website for some time now. We finally got round to migrating the podcast content to its own domain, mrbrownshow.com. We post show notes, show news and random behind-the-scenes nonsense on mrbrownshow.com, so do drop by for that additional content. We will also be launching new shows there as well. 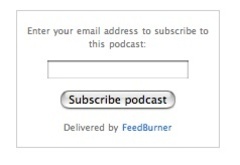 Besides subscribing to the mrbrown show podcasts via iTunes, or some other podcatchers using the subscription url, feeds.feedburner.com/mrbrownshow, you can also go Old School and subscribe to the podcasts via email. Just go to the About page of mrbrownshow.com and you will see the email subscription form there. Fill in your email address, respond to the verification email from our feed provider, and ta-da, you will receive email alerts every time a new show is uploaded. Don't worry, we will not use your email for nefarious purposes, or reveal it to other companies. Your info is safe with us. And you can unsubscribe anytime. 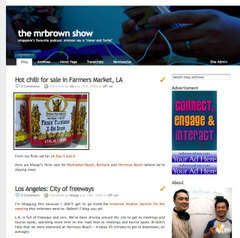 Enjoy the new mrbrown show site, guys. 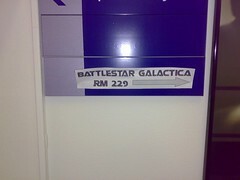 Updates on mrbrownshow.com, I get to meet the post-production guys who edit Battlestar Galactica, and Miyagi doesn't. And some cool chilli bottles we saw at Farmers Market, plus other photos from Day 5 and 6 of our LA stay. Go to the mrbrownshow site for a new podcast. Click to go there. The wife sent me these. You go away for a week or so, and your littlest one tries to stand, just weeks after you saw her belly crawl. Wow, they certainly learn fast. The mrbrownshow site has been updated. Click to get the podcast. Our third day in LA! The mrbrownshow site has the podcast and more photos. Click to get the podcast. "We would need workers who can communicate with not only the non-Singaporeans among us but all the visitors we are attracting to Singapore — tourists, those who come for conventions, meetings and so on. It would so ironic if we find many Singaporeans' English not suitable and we have to bring in foreign workers to work in these industries who can speak better English than we do." We would need workers who can communicate not only with not only (poor sequence) the (article unnecessary) non-Singaporeans among us but all (all is hyperbole) also the visitors we are attracting attract (present tense is used since article suggest future rather than current events) to Singapore — tourists, those who come for conventions conventioneers (why use 5 words when one suffices?) people attending meetings and so on. It would so be (choice of word) ironic if we find many Singaporeans' our (my stylistic choice) non-standard (better choice of word) English not suitable and we have compels us to bring in foreign workers who can (unnecessary) speak better English than we do can (polish up phrase sequencing; "can" a better choice than "do" as it denotes ability) to work in these industries. Italicised Blue: explanation of the correction. Hey, where did Tiger go? More technical bloopers from our TV networks network. Update: As littlecartnoodles pointed out, bloopers can happen very easily in a live environment, but this is a rerun of a Live recording. Hey, maybe they liked the blooper so much, they just had to share it again later in the day mah! Heheh. Behold! The Internet Trolls! Go see them in the wild at the mrbrownshow site. A new podcast has been added to the mrbrownshow site. "Faith misses you, you know," said the wife, over Skype. My heart sank. I missed the kids and the wife too, badly. "She has been so moody. Some nights, she wakes up in the middle of the night, and she looks at your side of the bed, and when she doesn't see you there, she makes a wuh wuh crying sound, and cries herself to sleep," the wife said. Traveling for work and being away from your family for such long spells is rough. I used to travel a fair bit some years ago, but it was not so difficult because we did not have kids yet. But now there are three, and that's three more loved ones to miss. These days, as more and more Singaporeans go overseas to seek new pastures, this kind of thing is only going to get more common. 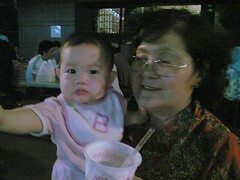 "She cheered up a bit, though, because your mom took Faith and all of us out for dinner, to eat satay at Lau Pa Sat." "That's nice," I said, "Should take her out more often then." "Ya, we all went. Faith, Isaac, Joy, the maids, and your mom. One big gang. Faith enjoyed her outing." Which explains this photo of Joy and mom that my wife emailed me. The next day, I called home and asked to talk to the kids. Isaac was his usual cheery self and we chatted about stuff, though I did not understand half of what my almost-three-year-old said. His older sister Faith ran away twice, not understanding why Papa's voice was on the phone. Celia managed to keep her still in the end, and held the phone to her ear. She did not say anything, because she cannot talk yet, but that was ok. I just wanted her to hear my voice telling her that Papa would be home soon. Some photos from their outing in this Flickr set. 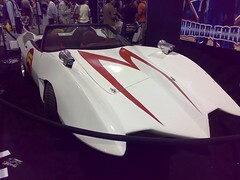 Video recording of the Battlestar Galactica event at Comic-con. BSG fans only need bother. Here is the link to the BSG video podcast (requires H.264 Quicktime). 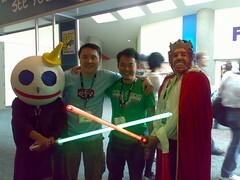 A pleasant interview with Comic-con veteran, Sam, who came dressed as Darth Burger King. To download the mrbrown show, 22nd July 2006 San Diego Day 4, click here to go to mrbrownshow.com. Also, more photos in a new Flickr set. Got part 1 and part 2 one, our podcast and it has been added to the mrbrownshow site, and some new photos too. Go download and listen to the mrbrown show, 21st July 2006 San Diego Day 3, click. We are here waiting to get into the halls after Pre-registration. The crowd here is buzzing, and it's not even Day 1. Tomorrow will be a zoo, I tell ya. 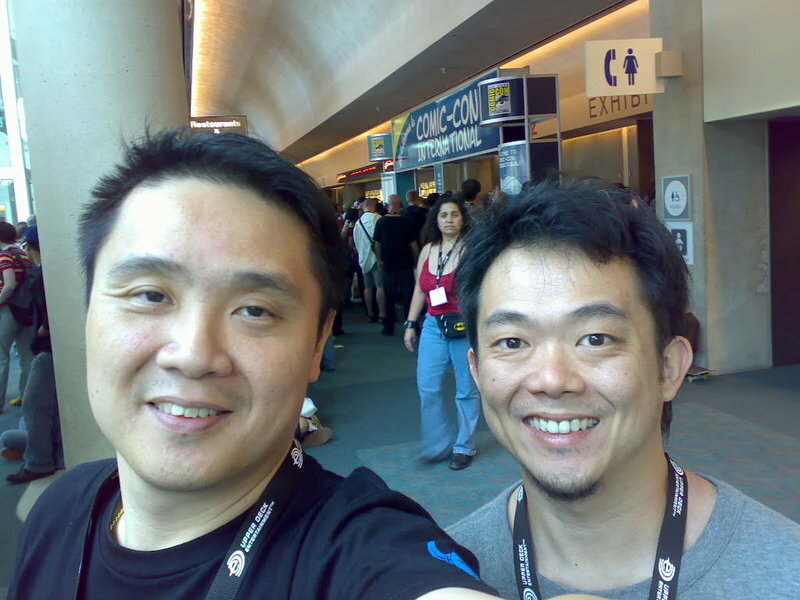 We've updated the mrbrownshow site with a new podcast from San Diego. Go download and listen, click. 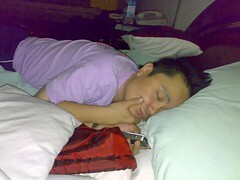 Take photo of me falling asleep in the middle of sms-ing my wife. I was tired ok? Jet lag and all. It has been a real challenge trying to call the missus to catch up. I miss the kids terribly, and her too. But with 15 hours between us, there are only a few timeslots to call, since she is working when I am awake, and I am working when she is asleep. When it is 11pm in Singapore (and she is available), it is 8am in San Diego (and I am struggling to get up). My alarm was set for 8am today, but it woke my roomies up (Miyagi ended up having breakfast, the DIY waffles at the reception), and did not wake me. I, on the other hand, was out cold. I hope this sleeping pattern thing stabilises soon. It's driving me nuts. More updates of our road trip to San Diego here. Miyagi interviews the hotel cleaner, Yuri, a technology student from Siberia and ends up dispelling myths about Asian women and food. This mrbrown show is sponsored by Razer Pro|Solutions™.